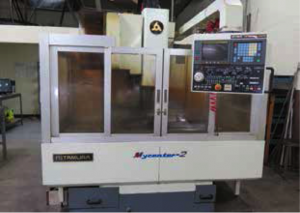 1990 Kitamura Mycenter-2 CNC Vertical Machining Center s/n 10948 w/ Fanuc Series 0-M Controls, 20-Station ATC, CAT-40 Taper Spindle, 7500 RPM, 16” x 36” Table, Coolant. Kasuga MR.K-55 CNC Vertical Machining Center w/ Fanuc Series 0-M Controls, 16-Station ATC, CAT-40 Taper Spindle, 5000 RPM, Hand Wheel, 19 ½” x 55” Table, Coolant. Okuma Cadet LNC-8C CNC Turning Center s/n 0709D129 w/ Okuma OSP5020L Controls, 12-Station Turret, Hydraulic Tailstock, 8” 3-Jaw Power Chuck, Coolant, Donaldson Torit Dryflo Fume Collector. Okuma LB15 CNC Turning Center s/n 6109.4092 w/ Okuma OSP5000L-G Controls, 12-Station Turret, Hydraulic Tailstock, 8” 3-Jaw Power Chuck, Coolant. Mori Seiki MS-850G 17” x 36” Geared Head Gap Bed Lathe s/n 9222 w/ 32-1800 RPM, Inch Threading, Tailstock, Steady and Follow Rests, 5C Collet Closer, Signal Tool Post, 10 ½” 3-Jaw and 12” 4-Jaw Chucks. Goodway “Bobcat” mdl. GW-1440 14” x 40” Geared Head Gap Bed Lathe s/n 65128 w/ 55-1800 RPM, Inch/MM Threading, Tailstock, Steady Rest, Dual KDK Tool Posts, Trava-Dial, 6-Station Turret Assy, 5C Collet Closer, 8” 6-Jaw Chuck, 8” 3-Jaw Chuck, 10” 4-Jaw Chuck, Faceplates. Hardinge mdl. HC Hand Chucker s/n HC-7048-T w/ 125-3000 RPM, 8-Station Turret, 5C Collet Closer, Power Feeds, Coolant. Bridgeport Series 1 – 2Hp Vertical Mill s/n 227453 w/ 60-4200 Dial RPM, Universal Kwik-Switch Taper Spindle, Chrome Ways, 9” x 42” Table. Bridgeport Vertical Mill s/n 171342 w/ 1.5Hp Motor, 60-4200 Dial RPM, Chrome Ways, Power Feed, 9” x 42” Table. 1997 ELB “Perfect 12 SPS” 12” x 48” Automatic Surface Grinder s/n 480441097 w/ ELB Controls, SBS Dynamic Balance Systems mdl. 2500 Digital Balance Controls, Programmable for Plunge and Traverse Grinding, Type BA022054876 Extended Wheel Dresser, 12” x 3” Wheel Cap., 12” x 48” Electromagnetic Chuck, Particulate Filtration and Coolant System. Gardner mdl. 120-A CNC Double-Disc Grinder w/ PC-Based Controls, Hand Wheel Controller, DC Feed Motors, Hydraulic Part In-Feed, 20” Grinding Wheels, Coolant. Harig 618 CNC II 6” x 18” CNC Surface Grinder w/ Siemens Sinumerik Controls, 4” x 12” Side-Mount Magnetic Chuck, Coolant. Sunnen mdl. MBB-1600 Precision Honing Machine s/n 43165 w/ 12-Speeds, Coolant. Taft Peirce 5” x 12” Surface Grinder s/n 349 w/ Magnetic Chuck. Burr King mdl. 960250 2” Belt Sander w/ Stand. Kasto HBA360AU 15” Automatic Hydraulic Horizontal Band Saw w/ Hydraulic Clamping and Feeds, Chip Conveyor, Coolant, Conveyor. Amada VA-900 36” Vertical Band Saw s/n 288 w/ 0-1800 Variable RPM, Blade Welder, 23” x 24” Table, 16 ½” x 22” Extension Table. Kaeser SK19 15Hp Rotary Air Compressor. Ingersoll Rand T30 10Hp Horizontal Air Compressor w/ 2-Stage Pump, 120 Gallon Tank. (2) Donaldson Torit Dryflo Fume Collectors. Century mdl. 135GS 110 Volt MIG Wire Feed Welder w/ Cart. Servo High Speed Precision Drill Press. (2) Richmill 4th-Axis 8” Indexing Rotary Tables w/ Controller. (4) Chick 4” Double-Lock Vises w/ Mounting Plate. 12” Rotary Table w/ Mill Center. Hardinge 8” x 9” 5C Indexing Fixture w/ Mill Center. Kanetsu 8” x 24” Fine-Line Magnetic Chuck. 6” x 8” Magnetic Chuck. Taft Peirce 5” x 12” Electromagnetic Chuck. 4” x 7” Fine-Line Side-Mount Magnetic Chuck. Greenerd No. 3A Arbor Press w/ Stand. NSK Erecter Precision Die Grinder. Weldon Endmill Grinding Air Fixture. Sunnen Mandrels, Truing Sleeves and Stones. Drills, Taps, Reamers and Endmills. ROI mdl. 150 Fiber Optic Light Sources, Computer and Acces. J & L mdl. EPIC230 30” Optical Comparator s/n E-72229 w/ J&L Decimetric II DRO, Auto Lens Selector 10X-20X-31.5X-50X-62.5X-100X, Surface and Profile Illumination, 8 ½” x 32” Table. Mitutoyo PH-350 13” Profile Projector s/n 177 w/ Mitutoyo DRO, Surface and Profile Illumination, 50X and 10X Lenses, 6” x 15 ¾” Table. Newage Industries “Versitron” Rockwell Hardness Tester. Mitutoyo 7” Height Master and 6” Riser. Sunnen PG-800S Preision Bore Gage. Sunnen PG-500S Setting Fixture and Finger Extension Set. Federal Dimensionair 4000:1 Air Bore Gage. Mitutoyo, Starrett and SPI OD Mics to 12”. Mitutoyo Dial Bore Gages 2.4”-4.0”, .7”-1.4”, .44”-.72”,.24”-.4”. Standridge 24” x 72” x 12” Grade “A” Granite Surface Plate w/ Stand. (2)Standridge and Precision 12” x 18” x 3” Granite Surfacelates. (4) Standridge 9” x 12” x 3” Granite Surface Plates. Precision 6” x 6” x 6” Granite Step Block. 2000 Toyota Tundra 9’ Stake-Bed Truck Lisc# 6J38069 w/ 3400Four Cam 24 Gas Engine, 5-Speed Manual Trans, AC, 98,283 Miles VIN# 5TBJN3214YS101508. Boman mdl. FBT15P-30-300PCSSF 3000 Lb Cap Electric Forklift s/n 216900040 w/ 2-Stage Mast, 118” Lift Height, Side Shift, Solid Tires. 4’ x 8’ Steel Table w/ Bench Vise.